STICKY chicken is full of flavour and universally popular. I love bringing the pan to the table to serve so everyone can see and smell how burnished and sticky the chicken looks straight from the oven. Don't panic if you can't lay your hands on ouzo or pastis, just use white wine. Make sure you use the smaller, more tender Greek olives rather than the enormous meaty Spanish ones that don't cook down quite so nicely. METHOD: Pat the chicken thighs dry with paper towel and season well with sea salt and black pepper. Heat the olive oil in a large oven-proof frying pan (I use a paella pan) over medium heat. Add the chicken, skin side down, and sear until golden, about five minutes. Flip and cook for a couple of minutes on the other side. Transfer to a plate with a slotted spoon. Pour all the oil out of the pan and then pour two tablespoons back in, keeping the rest to use later. Add the lemon wedges and garlic, and fry until the lemon wedges are charred on both sides. Transfer the lemon and garlic to the plate with the chicken. Preheat the oven to 180C. Add the onions, za'atar, oregano, fennel seeds and a pinch of sea salt to the frying pan, and stir to coat in the oil. Gently fry over medium-low heat, stirring frequently, for 10 minutes or until the onions are soft, sweet and golden. Add more oil if they start to stick to the pan or colour too quickly. Pour in the alcohol and stir with a wooden spoon as it bubbles up to scrape up all the delicious bits stuck to the pan. Cook until the smell of the alcohol subsides. 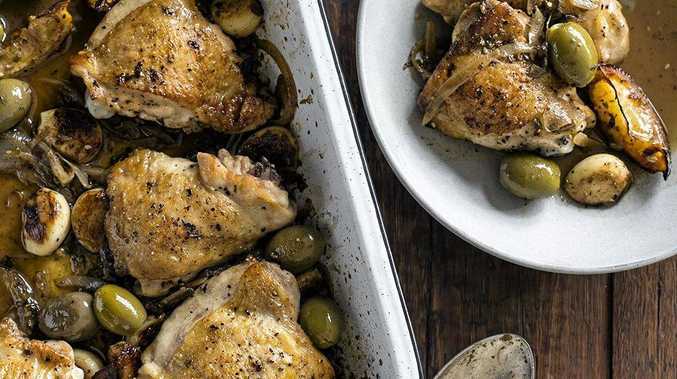 Arrange the chicken in the pan in a single layer, skin side up, then nestle the olives, lemon wedges and garlic in between. Pour the lemon juice over the top and add a little more salt and pepper. Roast for 45 minutes or until the chicken skin is crisp and golden, and the flesh is very tender. This dish is delicious served with rice or other grains, with the pan juices spooned over the top. Serves four. 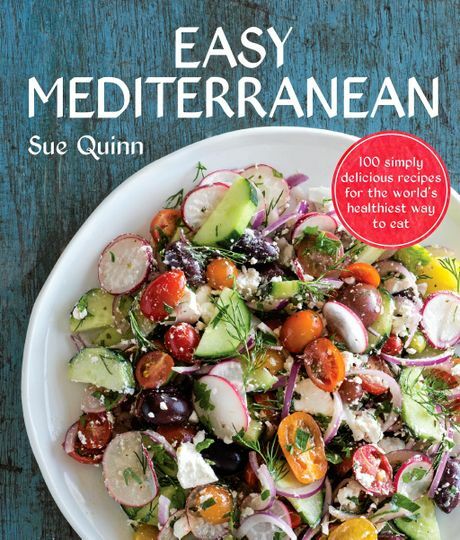 Recipes and images from Easy Mediterranean by Sue Quinn (Murdoch Books), available from August 1 in all good book stores and online.